Sometimes, it doesn’t matter what we do as the homechecker, the dog will make their choice. They have an amazing ability to scope out the people they are meeting and act accordingly. Sometimes, they will just not gel with the person you’re homechecking, and on other occasions, they will make their opinion known in other, less subtle ways. 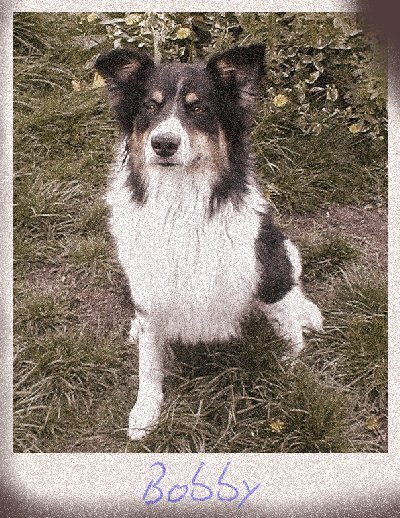 Bobby was a large clown of a Collie dog. He was a big, tri-colour with a huge amount of fur that made him look like a colossal teddy bear. He was the most outgoing, large, happy idiot of a dog, whose idea of a good time was just bumbling around making people laugh. Bobby was a prime example of finding it difficult to home a fantastic dog, simply because he just seemed too good to be true. Of course, it probably didn’t help that he had his own techniques to put any potential adopters off. He even managed, of all things, to a fake a ‘squint’.